Turquoise skies graced with billowing clouds were reflected in the pool beside the burbling stream. In the distance the familiar clanging of cow bells mingled with chirping of birds that could be heard in the peaceful valley. We were in hiking paradise. Franz and I were visiting “the only heaven on earth” the Nenzinger Himmel settlement in Vorarlberg, Austria to celebrate my birthday. This pristine outpost is located at the end of a dramatic rocky gorge that winds along the Gamperdona Valley just above Bludenz and situated on the borders to both Switzerland and Liechtenstein. The sparkling Mengbach (Meng River) cascades through the ravine 16 kilometers until it reaches the River Ill. High mountain peaks of limestone and dolomite loom over the fairytale like setting below. 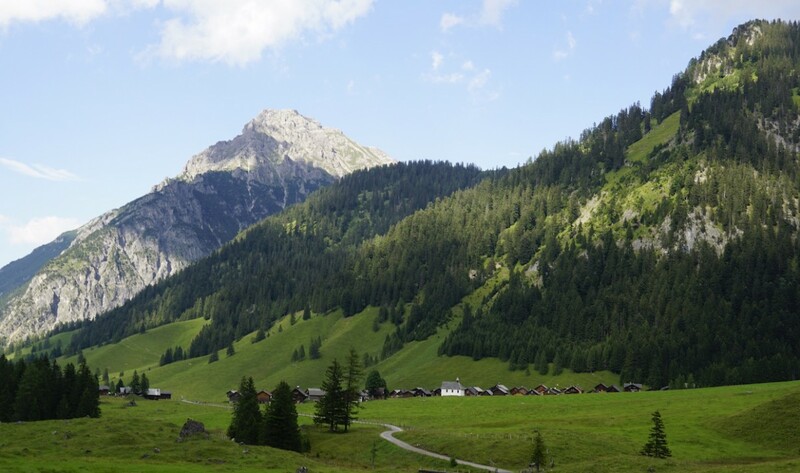 The village is comprised of 200 cottages and one simple hotel called the Alpengasthof Gamperdona at which we stayed. Tourism is permitted during the summer months with tightly controlled road access that ensures the integrity of the nature park. Hiking paths abound from the hamlet to emerald lakes and meadows bursting with alpine flowers. What a way to spend one’s birthday. I highly recommend it!